Our Annual Autumn Sale starts Friday, September 21, 2012! Our First Annual Autumn Sale is almost here! 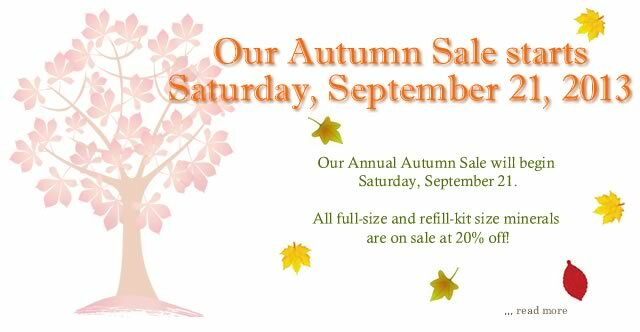 From Friday, September 21, 2012, until Friday, October 5, 2012, all of our full-size and refill-kit-size minerals will be on sale. In celebration of a recent personal achievement, sale prices will reflect a 30% discount from Friday, September 21 until midnight on Sunday, September 23. From Monday, September 24 until the end of the sale on Friday, October 5 sale prices will reflect a 20% discount. No promotional or discount codes are needed for this sale which includes all full-size and refill kit sizes of Mineral Foundations, Blushes, Bronzers, Eye Shadows, Lip Glosses, as well as all Brushes and Accessories. Please be sure to stock up on your favorite Buff'd mineral products as once the sale is over our next sale is not until our Annual Winter Sale in December 2012! Sale ends midnight Friday, October 5, 2012. Our Ghastly Halloween Shades Return! Just in time for Halloween, Buff'd Cosmetics has concocted some chilling new shades for every ghost and goblin. For those frightening witch costumes we formulated Gruesome Green Mineral Foundation. Made from the same minerals as our Original formula foundations, Gruesome Green goes on a thick vibrant green but feels like wearing nothing at all! Our Death Becomes You foundation is perfect for those costumes where only the sickliest and hollow complexions will do! Together with our Ghostly White foundation we will make even the healthiest skin appear pale and sickly! And of course, no costume would be complete without our Bloodcurdling Black lipstick - formulated with the same natural ingredients as the rest of our mineral lipstick line. Pumpkin Pie and Fright Night mineral eye shadows round out our Halloween collection! Buff'd Mineral Cosmetics are made with the finest minerals and pigments - all free of irritants and toxins.